The Yaquí is perhaps one of the most unique cajóns within the DG line. Aside from the beautiful 2.5 mm Avio Birch front-plate (available in striking Makassar, Iris, and Rosewood veneers), the Yaquí features jingles attached to the centre-post which vibrate lightly when bass-tones are played, adding an overall brightness to the tone. The sides and back of the instrument constructed of FSC (Forest Stewardship Council) certified birch and are varnished with a double coating of polyurethane lacquer. 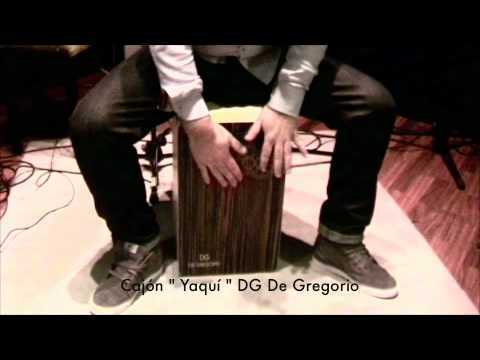 The Yaquí has a very modern “bass drum and brushed snare”, with an added sprinkle of jingles, a sound which can be heard on many recordings, including offerings from flamenco star Miguel Poveda (“Arte Sano”) as well as super group UHF (“Bipolar”), both featuring cajón legend and DG artist Paquito González.